if you can. . . Animals and insects use camouflage to hide from hunters or to ambush prey. Stealth is a very useful technique when it comes to survival. 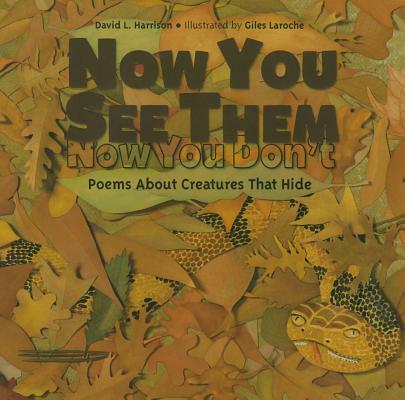 In this fun and informative collection of poems, we meet animals such as the polar bear and the octopus; the ghost crab and the copperhead snake; and many more that use camouflage to hunt or to hide. Giles Laroche’s intricate cut-paper illustrations are beautiful and life-like. Readers will have to look carefully or run the risk of a hunter sneaking up on them. Back matter offers additional information about each of the nineteen animals. David L. Harrison has published more than eighty books, has been a keynote speaker or presenter at 265 state, regional, and national conferences in 30 states and has an elementary school named after him. David first book for children, The Boy with a Drum (Golden Press), was released in 1969 and has sold two million copies. Giles Laroche has illustrated many children's books and both wrote and illustrated If You Lived Here: Houses of the World (Houghton Mifflin). Every illustration he makes involves drawing, cutting, painting, and gluing--and often has seven or eight layers. *Nineteen different animals, placed in five animal categories, are represented first by artwork and poetry and finally by brief paragraphs and references for further reading. The poems are graceful and often humorous, giving good introductions to the reasons behind each animal's protective coloration. The illustrations, which involve "drawing, cutting, painting, and gluing," likewise effectively convey how camouflage works, without pretense of photorealism. The categories—sea life, reptiles and amphibians, mammals, insects and spiders, and birds—reveal a wide variety of animals, from ghost crab to Bengal tiger, walking stick to hawk. An especially funny but accurate poem is the double-page spread about the copperhead, whose letter to "Mr. Vole" is full of sibilance, reinforced in a literal sense: "Find me / if you can, / my sssskin / deceivessss, / helpssss me / dissssappear." The accompanying art shows the mottled, coppery serpent under a scattering of autumn leaves. In contrast, a fawn hides, scentless, "saved by fawny / polka dots / that blend with / gentle sunny spots." The text educates young readers about useful camouflage for predators and for prey, without resorting to anything truly disturbing. Other than a "buzzy fly" becoming "fast food" for a spider and some tiny fish disappearing, predators are shown as merely threatening, and prey are shown as successfully hiding. Endnotes, cover, and layout all add to a thoughtful, well-executed book. An attractive, informative blend of science and the arts. In this attractive collection of poetry about camouflage in nature, 19 entries are grouped into five sections: "Sea Life," "Reptiles & Amphibians," "Mammals," "Insects & Spiders," and "Birds." Each selection focuses on one creature, highlighting its use of camouflage in the wild. The verse is brief but catchy, and Harrison's sound use of rhythm and rhyme results in offerings that are pleasant to read aloud. Each poem is accompnaied by an illustration done in cut-paper relief on hand-painted papers. Reminiscent of Steve Jenkins's collages, they are lively and engaging. Back matter contains additional information about each creature, including its scientific name and a few suggestions for further reading. VERDICT An altogether appealing volume for young poetry aficionados and animal lovers alike. Nineteen varied poems, illustrated in cut-paper relief, describe examples of animal camouflage to young readers. Using instances from sea life, reptiles and amphibians, mammals, insects and spiders, and birds, Harrison's succinct poems detail the techniques used by these creatures to avoid detection. In "Bumblebee Moth," for example, "A moth that looks / like a bumblebee / is nature's gimmick / to scare away / its enemies / and save the mimic." Laroche's colorful artwork is appealing both in its attractive design and scientific detail. His spreads clarify and sometimes extend the text, as in "Crab Spider," about an arachnid, depicted on two differently-hued flowers, which changes colors to blend with its surroundings. Extensive back matter provides additional information about each species and offers suggestions for further reading. Helping to bridge the gap between science and literature, this joins the growing number of excellent nature poetry titles, such as Joyce Sidman's Winter Bees and other Poems of the Cold (2014) and Irene Latham's When the Sun Shines on Antarctica and Other Poems about the Frozen Continent (2016).